These various words remind me how deep places are, how much longer-lasting than I am, how in flux they are and yet the same. They remind me of the receptivity of places, allowing me to be here, giving me a kind of love. These found words tug me into the place itself, link me to the deeper meanings it contains. And always by insisting that many belong, and I belong: I’m here, reading. Of course I also love to read books. And since I’m going somewhere with this post, I’ll just say that I recall many reading experiences that took me into places I didn’t know, but then came to know by reading. That’s what stories and poems can do. But I also recall, as I began to read in a strongly emerging “Canadian literature,” the astonishing sense of reading about places already mine. My country for sure, and sometimes my actual locations. Morag in The Diviners attends university in Winnipeg where I did! My home city Winnipeg shows up like a character in Carol Shields’ marvelous repertoire. This overlapping seems almost commonplace now as our national literature has grown and diverged in so many interesting ways, but many of us, I suspect, can remember the time reading first connected with here. So here’s where I’m going with this: to Project Bookmark Canada, a “national, charitable organization that places text from stories and poems in the exact, physical locations where literary scenes are set.” You know I don’t often use my blog to promote causes, but this one really intrigues and excites me and so I hope you’ll indulge my enthusiasm and check it out for yourself — and hopefully join in too. I think it’s a profoundly significant project because it layers things that really matter: this country, our places, good writing. This entry was posted in Books, Current events and tagged Carol Shields, Michael Ondaatje, Page Turner, Project Bookmark Canada, The Diviners, Winnipeg, words in public by doradueck. Bookmark the permalink. When Hardy and I took our trip to Poland and Ukraine this past autumn we were so moved by reading the historical markers at churches, cemeteries, former places of business, etc. because most of them linked us to our ancestors and our ancestral home. We had a sense of belonging and a sense of home, just like you describe it! I just finished reading Martha Smith Good’s book “Breaking Ground: One Woman’s Journey into Pastoral Ministry.” She is from our former home area, Kitchener/Waterloo, and she casually mentions going out for a dinner date to the nearby Swiss Castle Inn. I knew exactly what she was talking about and memories came flooding in! 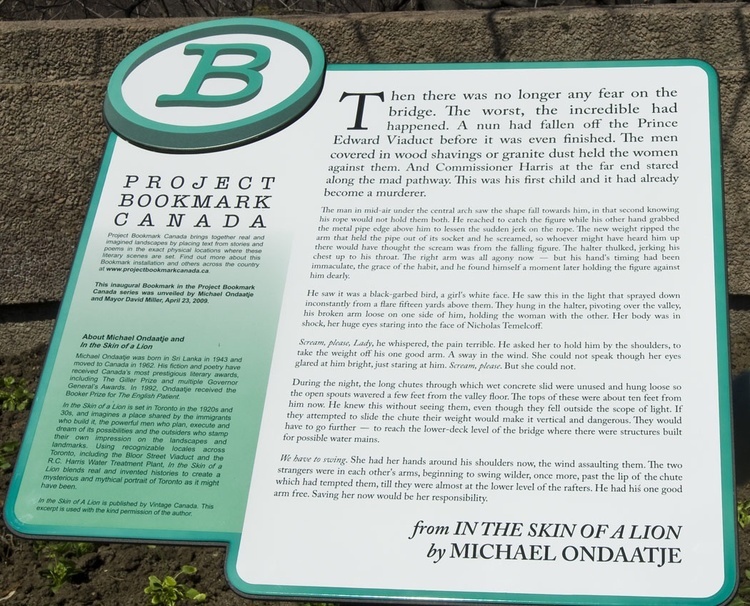 I think this Project Bookmark Canada is a fantastic idea! I appreciate the experiences you add to this, Elfrieda. And glad you agree, the Project is a fantastic idea!